Last night saw the latest evolution of the COC’s Ensemble Studio competition; a competition for cash prizes functioning as well as final auditions for next year’s Ensemble Studio. 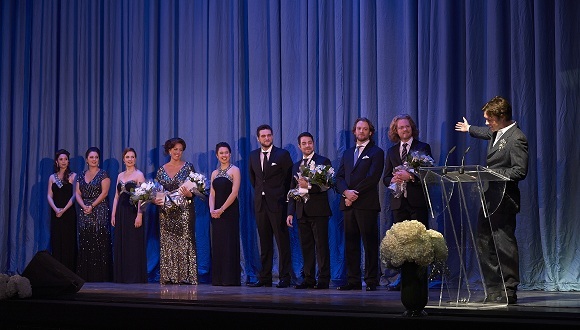 This year, for the first time, it was packaged as Centre Stage; a gala event featuring a cocktail reception and black tie dinner as well as the competition itself. Added to that, the singers got to perform with the COC orchestra under Johannes Debus on the main stage rather than in the RBA with piano accompaniment. Last night I was in a very full Richard Bradshaw Amphitheatre for the second annual COC Studio Ensemble competition. Ten singers, selected down from 146 in auditions across Canada and in New York were competing for cash prizes and an opportunity to join the COC Ensemble Studio. COC General Director Alexander Neef chaired the panel of judges which included soprano and teacher Wendy Nielsen as well as assorted COC brass. Chorus Master Sandra Horst MC’d in her own inimitable fashion. The format was typical of such events. Each singer offered five arias. They got to sing one of their choice and then the judges requested a second from the remaining four. Piano accompaniment alternated between the equally excellent Rachel Andrist and Steven Philcox.